Our study reports a counter-intuitive finding that China and India, the two most populous and emerging countries, rather than the developed nations, are leaders in greening the lands through the planting of trees and intensive crop cultivation. The study shows that there is now about five and a half million square kilometers of extra green leaf area yearly compared to the early 2000s, a 5% increase, but this is mostly due to intensive land-use in China and India. This is a surprising twist as a previous study by some of the same researchers found carbon dioxide (CO2) fertilization as the main reason for the greening of Earth’s lands. The current study uses high quality satellite data from NASA’s MODIS sensors that view the entire Earth twice a day at 500 m resolution to base their findings and identifies processes related to how humans use the land missing in Earth System Models as the reason for the previous conclusion. 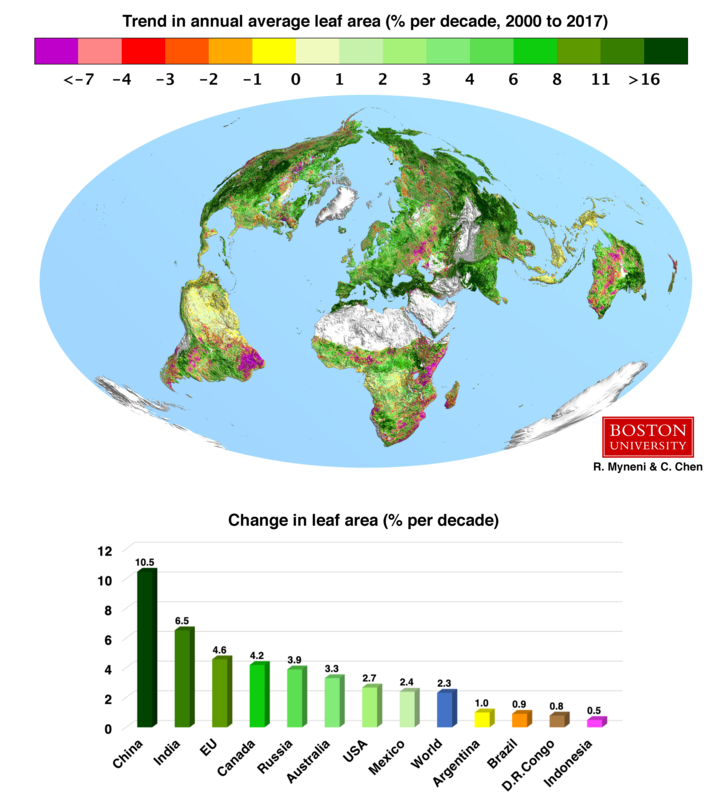 The greening over the last two decades represents an increase in leaf area on plants and trees equivalent to the areal span of the entire Amazonian rainforests. Green leaves produce sugars using energy in the sunlight to mix CO2 drawn in from the air with water and nutrients pumped in from the ground. These sugars are the source of food, fiber and fuel for life on Earth. 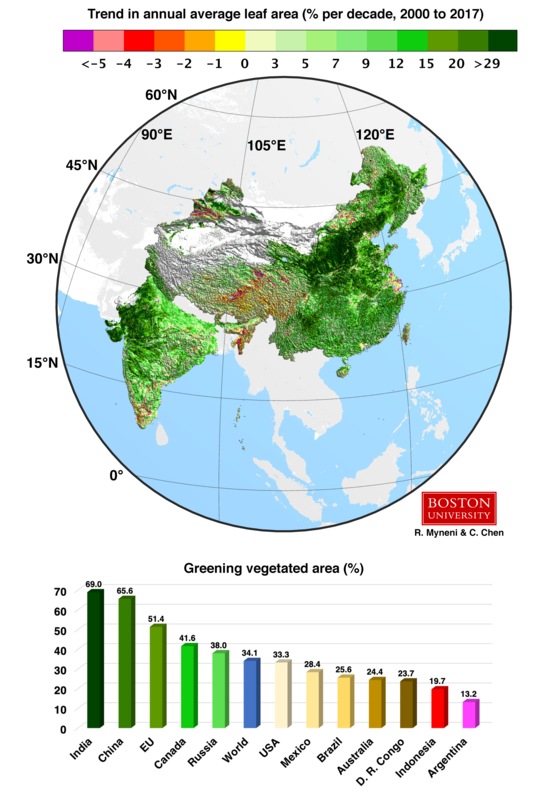 China and India account for one-third of the greening but contain only 9% of the global vegetated land area, a surprising finding considering the general notion of land degradation in populous countries from over-exploitation. The greening is due to intensive agriculture in China and India to feed their large populations and ambitious tree planting in China – with the goal of mitigating soil erosion, air pollution and climate change. Land area under crops in China and India is comparable, about two million square kilometers, and has not changed much since the early 2000s. However, total food production (grains, vegetables, fruits, etc.) has increased greatly – by about 35-40% since 2000. Increased food production in China and India is mainly due to increased harvest area accomplished through multiple cropping in a year and facilitated by heavy fertilizer use and surface/ground-water irrigation. Every year, about one-half of the 10 to 11 billion tons of carbon emitted in to the atmosphere from burning of fossil fuels and tropical deforestation remains temporarily stored, in about equal parts, in the oceans and land plants and soils – the so-called carbon sinks. Unlike greening due to large-scale tree plantations in China, sustainable forestry practices in Western Europe and tree re-growth on abandoned lands in Eastern Europe, greening due to intensive agriculture does not enhance the carbon sink because crop carbon quickly returns back to the atmosphere. On the other hand, though browning is observed in only 5% of the global vegetated area, some of this is in the pristine tropical forests of Brazil, D. R. Congo and Indonesia, raising concerns about those ecosystems’ resilience and sustainability. The current study points to human use of land as one dominant driver of Earth’s greening but it is unable to quantify the precise role of other drivers, namely CO2 fertilization, climate change, nitrogen deposition, recovery from disturbances, etc. Therefore, Earth System Models should be refined to include a realistic representation of key land-use practices identified in this study – multiple cropping, irrigation and fertilizer use, fallowing and abandonment of land, afforestation, reforestation and deforestation. Back in 1997, Myneni of Boston University and his colleagues detected the greening phenomenon using satellite data, first in the far northerly lands and subsequently at the global scale. The greening in some parts of the southern Arctic is now less pronounced due to slower growth of shrubs and trees on the tundra and some browning trends are visible in coastal areas of the Arctic. The recent works of some co-authors provide strong additional evidence for the connection between human land-use and the greening phenomenon in Sub-Saharan Africa and Europe.